Welcome to my Irish Author blog, Philip, it is an honour and privilege to have you grace our pages. A: Thank you, J.P. It is quite a pleasure to have this opportunity. It’s difficult to know where to start introducing someone who has left their mark all over the world for the past 55 years or more. You could be described as one of Ireland’s greatest living artists. Can you share with our readers where you “got your start,” as they say in Ireland? A: During an illness from the age of eleven to thirteen, I lost out of school for two and a half years, but I found peace in drawing, which I began doing to pass the time. At the age of fifteen, I entered art school and I was accepted into the Royal Hibernian Academy of Ireland. That is the annual exhibition of artists from all over. I had submitted my paintings and received a private scholarship at sixteen years of age to study in Paris at The Académie de la Grande Chauniere, in Montparnasse. I studied there under Yves Brayer. That was from 1961 to 1962. After that, I returned to art school in Dublin when I was seventeen, to finish studies and to continue exhibiting in the Royal Academy for the next few years. I was asked to be an assistant professor, as I was a qualified art teacher, even though I was still only seventeen. It is difficult to comprehend how someone so young could attain such lofty heights. Did it occur to you that it was extremely unique for a boy of your age to be held in such high esteem and were you always aware of your great gift? A: I loved what I did and was passionate about drawing and the arts. I was nervous though, as I didn’t think I could repeat my last painting and was therefore apprehensive about how the painting would turn out. Having had the good fortune of getting to know you over the past several years, I have immensely enjoyed listening to many great stories of your escapades around Dublin, London and Spain. One of my favourites is the time when you were knocking around with another Dubliner, the rebellious playwright, Brendan Behan. Can you tell my readers about the time that you and Brendan were “on the tear,” and you had to drive him to Dublin airport the next morning to catch a flight to New York? A: Well, as everybody knows, Brendan was very fond of his drink and I enjoyed a bit of it myself, of course. We were out on the town in Dublin several days leading up to St. Patrick’s Day. I had met him in a well-known literary pub, called McDaids. We commenced a pub crawl around Dublin, which ended up in Dolly Fossetts on the quays. We had a hip flask of Powers whiskey and we mixed it with our tea as we waited for the early morning houses (pubs) to open. After a long night’s revelry, he asked me to drive him to Dublin airport the next morning. He was to catch an Aer Lingus flight to New York, where he had planned on riding a white horse along 5th Avenue, as part of the St. Patrick’s Day parade. He was doing that in memory of the poet Dylan Thomas, who died of alcohol poisoning after drinking all night and collapsing outside the bar of the White Horse Tavern, in Greenwich Village. We arrived at Dublin airport a half hour after the plane was scheduled to take off, but Aer Lingus had held the plane for Brendan, as he was known far and wide at that stage. As he got out of my car, I gave him an overnight bag, as he only had the clothes he was wearing. The bag had an extra shirt, razor, soap and a bottle of Old Spice aftershave. It seems that shortly after take-off, Brendan tried to get served alcohol, but was refused, since they could tell he had been drinking all night. Undaunted by being turned down, he proceeded to drink the bottle of aftershave for its alcohol content. That was the last straw. The plane made an unscheduled stop in Shannon and Behan was put off. That was as close as he got to New York and the St. Patrick’s Day parade! What an incredible story. I usually have a pint of Guinness myself, in McDaids when I am in Dublin, but from now on, I’ll always remember this story when I go there! Like a lot of Irish, you had a wandering soul. Of all the countries you have lived in over the years, which one would you say was, or is your favourite? A: I have to say Spain. I had a passion for Spain, as it was a very passionate country. Next would be Cuba. I liked Thailand, but the humidity was too much for me. I also liked Nassau very much, when I was the visiting artist there in 1995. I have seen many of your paintings from your time in Cuba. Do some countries inspire you more than others? A: I found inspiration the strongest in Paris as a youth and after that came Spain. In latter day years, I’ve come to love the natural light and the rawness of Connemarra. I know this is probably impossible to answer, but do you have an idea of how many paintings you have created over the years? A: Several thousand paintings and at least 20,000 drawings. 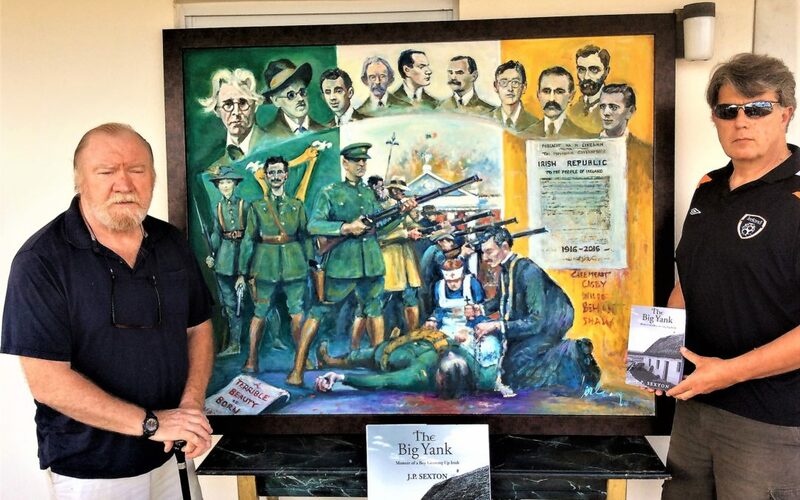 I can tell you that of all your paintings which I have seen, my absolute favourite is the beautiful 1916 piece, which you created last year to commemorate the centennial of the 1916 Uprising. I am aware that you also painted many murals in Irish bars around New York City, which makes me wonder if I have seen some of your famous murals, without realizing at the time who had painted them. It seems that murals were an important feature in bars in New York, in the 70’s to 80’s. Was that unique to Irish bars? A: At that time, yes. My first mural was in Fleet Street Bar and Restaurant on 3rd Ave. That took me two years to complete. It was 40 feet long by 10 feet high. Word got around and the next one I did was at Eamon Doran’s Old Stand. Others included Diamond Jim Brady’s, which ironically is the setting for a new T.V. series at the moment. I know this because the company involved with filming, asked me for permission to use my mural in their forth coming series. These days you are spending a lot of time in Connemara, capturing the unspoiled West Coast on your canvas. It is the complete opposite to where you grew up in Dublin City. Tell us how it feels to be surrounded by such beauty and if you feel it will be able to hold out from the developers’ reach. A: I think development won’t be a threat, as the rawness of it will sustain and survive any development. I found the village of Roundstone to be warm and inviting. I feel as if they have adopted me into their local family. Before we go, I’d love to hear one of your favourite stories. May we coax another one out of you? A: Of course! I had my stag Party at The Baggot Mews in Dublin’s Baggot street. It was early June, 1964 and I was nineteen years old. There probably would have been around eighty to one hundred guests attending the bash. The two Truman brothers were in charge of the door. We heard a bit of a commotion, so I went to the door to see what was going on. A ragged group of young men arrived at the door and said they were the Rolling Stones. The brothers told the Stones that they didn’t give a shite who they were, they were not being allowed to come in “dressed like that.” Then they made an attempt to get past the door men, which resulted in the brothers throwing out the Rolling Stones and chasing them down the street. That was probably the Rolling Stones’ first time in Dublin and for sure the first time they got thrown out of a club! That is truly legendary. What I wouldn’t give to be able to watch you meet up with Mick Jagger one day and remind him of the night the Rolling Stones got kicked out of your stag party! 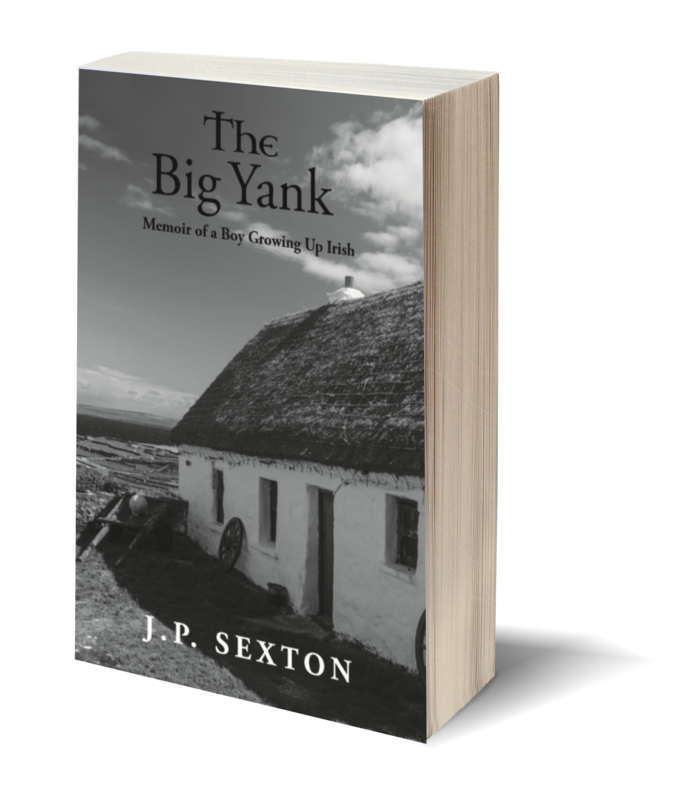 Author yourself and always recommend your recent Bestseller the Big Yank. Thank you, Stephen. Your da is an incredible artist. His range and versatility is spectacular. Mr Sexton very interesting interview . The stories also interesting, I suspect that there may just be more where they came from ?. The proverbial tip of said iceberg… possibly?. May I say a very nice piece commentating the 100 yr anniversary. a sup or two of fine uisce beatha!